Art historians – perennially on the outside looking in – have, starting with Giorgio Vasari in 1550, loved to give the Old Masters an aura of mystery and alchemy while the reality of the artist’s life, yesterday as today was, sadly, much more prosaic. Rembrandt’s relationship to his clients was less the lonely misunderstood genius more that of a tradesman providing a professional service and because he was acknowledged to be a very good artist making them pay heavily for the privilege. Rembrandt’s career is particularly unusual in that despite his precociousness being recognised early on in his career even before he moved from Leiden to the capital Amsterdam, he is one of the few Dutch masters who never travelled abroad. Generally, artists went on a Grand Tour to Italy particularly Rome, the Mecca of all talented Dutch, Flemish, German and English painters of the period. When you think about it, Rembrandt, one of the greatest Baroque artists of his time, got all his information about current art trends second hand. The influence on his style came mostly from prints of famous paintings that circulated through Europe and from which artists drew freely for their inspiration, something unthinkable today if not specifically forbidden by our current copyright laws. Well known Dutch artists like Jan Steen and Matthias Stomer who had gone to study in Rome, absorbed the new style and imported the Baroque into Holland on their return where Rembrandt would have seen this way of using light as a fresh element in making paintings. During those years a number of legendary European masterpieces passed through the Amsterdam auction houses of which Rembrandt was a regular spectator and were an important influence on his artistic style. Raphael’s Baldassare Castiglione was up for sale in 1639 and the sketch Rembrandt made of the painting during the auction is now in the Albertina museum, Vienna. 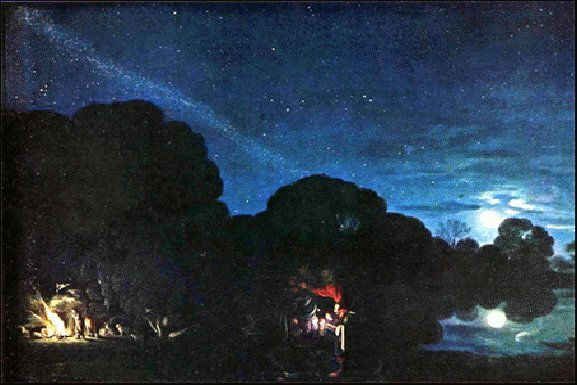 A down and out artist from Frankfurt-am-Main in Germany, Adam Elsheimer who, like Raphael, died in his thirties in Rome had a disproportionate influence on Rembrandts dark Baroque style. 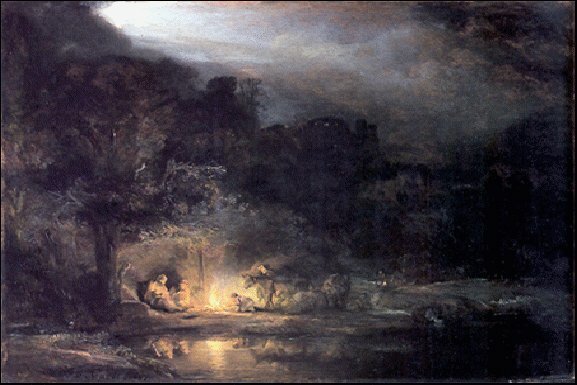 He probably never did see Elsheimer’s tiny painting on copper ‘Rest on the Flight into Egypt’ unless it had passed through an auction house in Amsterdam in Rembrandt’s time and more likely saw a print reproduction. Yet a generation later Rembrandt created signed and dated the little masterpiece in oil on oak of the same title that is now in the National Gallery of Ireland that is remarkably similar to Elsheimer’s. the Flight into Egypt (1647). Dublin, National Gallery. The dark mysterious Old Masters of legend often owe their reputation to the techniques, colours and materials artists used, the poor conditions in which paintings were hung and the heavy handed intervention of picture restorers. Artists in Rembrandt’s day painted onto oak, cherry or mahogany panels that they bought from their local art supply store. The panels were delivered coated with a thin layer of white chalk or flesh-colour priming or undercoating that the artist would seal with a thin layer of oil before beginning his picture. However, experience shows that Dutch artists frequently painted directly onto the wood panel itself without first priming it. This is why many are so dark as, with time, the colours fade or become transparent and the dark aged wood support becomes the predominant colour. It makes cleaning Dutch Old Master paintings particularly difficult as their delicate style and technique leave no margin for error: the author has, over the years, come across Dutch and Flemish paintings that amateur D.I.Y. picture-cleaning attempts have partially wiped away as a result. As time went by and the masters canvases aged the painting itself would disappear gradually from view under thick dark layers of grease, black soot and smoke pollution that built up on the picture surface. Open wood and later, coal fires, candles and oil lamps and the lack of glass for protection were the culprits. In the 19th century the invention of a dark brown viscous varnish much loved by contemporary picture restorers, the infamous ‘gallery varnish’ a formula of boiled linseed oil and copal or amber resin applied liberally to the picture surface ensured the Old Masters continued to have that aged golden tone art lovers expected. In the Pantheon of the arts Rembrandt can safely claim his place amongst the great and the good but, it seems, in his treatment of women he did have a nasty streak in him. Artists in the golden age of Dutch painting became upwardly mobile presenting them with an opportunity to marry well. This was the case with Rembrandt. While a big earner he appears to have been perennially short of money. In 1639 he used his new wife Saskia van Uyenburgh’s dowry to partly pay for an expensive Amsterdam mansion that is now the Rembrandthuis. After Saskia’s premature death following the birth of their son, Titus in 1641 everything started to go wrong for Rembrandt. His domestic situation deteriorated with ensuing money problems caused by incessant court battles with Saskia’s relatives over her estate. The marriage contract had established that he could continue to enjoy the money on her death only if he remained a widower. Rembrandt’s extravagant lifestyle, however, his mania for collecting Old Masters, rare prints and antiques and the short-term high-interest bearing loans he had taken out to keep up repayments on his house and workshops put a stop to any ideas he might have had about getting married again. This state of affairs created friction with Geertje Dircx who, hired to look after Titus, was putting pressure on him to marry her. Geertje eventually took him to court in 1649 for breach of promise (he had given her a number of valuable rings that had belonged to Saskia, in betrothal, and when they got to hear about it raised the hackles of her relatives). as Danae, the Hermitage, St. Petersburg. Under the settlement terms reached in the action, Rembrandt paid Geertje a life pension; this, coinciding with a slowdown of painting commissions, aggravated his already deteriorating financial circumstances. By this time Geertje was suffering a serious nervous breakdown. It permitted Rembrandt in 1650 to have her committed to a female sanatorium. This distasteful feat allowed Rembrandt the freedom to turn his attention to a new housekeeper, Hendrickje Stoffels, the subject of many subsequent paintings, a situation the somewhat prudish Vasari in his day would have frowned on.